Heat your oven to 180C. Lay the pumpkin seeds on a tray then gently dust the cinnamon over the top of them before roasting in the oven for approximately five minutes, until aromatic. Remove from the oven, set aside and allow to cool. Rinse the kale under the cold water tap then set aside on a clean, dry tea-towel. Bring the sides of the tea-towel upwards and dab off any excess water. 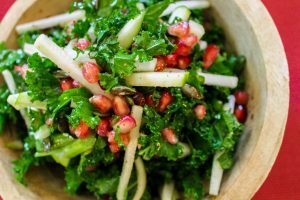 Using a sharp knife and a chopping board remove the hard stalks in the center of the kale leaves. Roll the kale up tightly then thinly slice it, shredding it into very thin ribbons. Transfer to a large mixing bowl. Cut the pomegranate in half then hold it over another large mixing bowl. Hold the pomegranate as though you are holding a disposable coffee cup (for example) fruit face down. Squeeze the fruit whilst simultaneously beating the top of the fruit with a wooden spoon. This will help the pomegranate release all its juice and seeds. Repeat with the second half of pomegranate then pick out any pith in the mixing bowl with your fingers. Peel and slice the kohlrabi thinly (about the width of a pound/euro coin), then pile up the slices of kohlrabi and slice thinly again, leaving you with match stick pieces of the vegetable (known as julienne). Repeat this process with the Granny Smith apple (you can leave the skin on the apple if you like). Transfer all of the ingredients to the same mixing bowl as the kale then add the raisins. Add a few a good glugs of olive oil, a tablespoon or two of white balsamic vinegar and some salt and pepper. Mix well then set aside for around 15 minutes before transferring to a serving dish. This allows the vegetables to soften slightly and for the flavours to infuse.